Hanoi (VNA) – Vietnam is transforming from an exporter into an importer of energy to ensure its energy security, heard a workshop held in Hanoi on August 24. Vietnam’s energy demand has increased rapidly over the last 15 years, with a commercial energy growth rate of about 9.5 percent each year. It is forecast to continue rising strongly in the next 15 years. The country’s electricity consumption demand grew about 13 percent annually from 2006 to 2010 and 11 percent each year between 2011 and 2016. The country plans to import around 17 million tonnes of coal, or 31 percent of the coal needed for electricity generation, in 2020, the workshop heard. 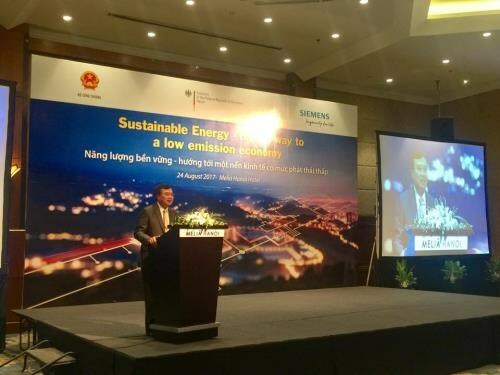 At the event, organised by the Ministry of Industry and Trade, the German Embassy in Vietnam and Siemens group, Deputy Minister of Industry and Trade Hoang Quoc Vuong said the two countries have strongly cooperated in renewable energy, energy saving and power transmission over the past years. Notably, the German Government has supported its Vietnamese counterpart in developing wind power projects through official development assistance.